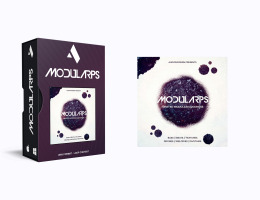 Introducing ModulARPS a loop based sampler instrument for NI Kontakt also available on WAV, AIFF & REX file formats. Created by a unique modular setup and controlled by Sound designer Adam Ritchie, ModulARPS holds one of the finest collection of experimental Ambient sounds Audiomodernhas ever assembled. Inside this library you will find a vast array of sequence loops divided into folders Bass, Beats, Melodies, Textures, Drones, Rhythms and all designed to fit together perfectly. Expect the unexpected in this twisted library of modular goodness. Covering all styles from Ambient, experimental, New Age minimal to the most modern of technical productions, this pack guarantees to add depth, warmth and character to your next composition. These unique library of modular loops is designed to work in a range of musical and sound design scenarios and contain a huge selection of highly original sounds that are guaranteed to bring life and character to any media production. A journey in textural sound design, an exploration into harmony and an experiment in groove. From sound textures to screaming modular leads, the inspiration on offer is endless. Don’t let this one pass you by, it will become an integral part of your sample arsenal! Adam Ritchie is a musician, teacher and film composer specializing in guitars, modular synth and other forms of sound synthesis, blurring the line between music and sound design. He has been involved in many creative projects over the years, including film, interactive installations, audio-visual projection mapping, dance and live bands. Through such varied experience he has developed a name for creating dark yet beautiful atmospheres and textures that are combined with floating melodies, industrial beats and glitch pulses. r.domain is the solo project of Adam Ritchie which can be found on most social platforms. Visit aritchie.com for more information. All loops have been created using a large modular synthesizer and various analogue effect units. As usual, this epic collection comes 100% royalty free & is available in KONTAKT, high quality 24 Bit Wav, AIFF & REX file formats. Native Instruments' Kontakt Full Retail version of KONTAKT 5.3 or higher is required. This may be purchased from the Native Instruments site here.